Craving some cheers for the new year? Tune in to the Wheel of Fortune from February 2nd to February 4th to get the Lunar Beast - Blackpyre! This new mount is a mythical creature that loves to devour flames, which it uses to incinerate enemies. Unlock Blackpyre, raise your BR and enhance your squad to new heights! When winter nears its end around the Lunar New Year, the people of the Grace Continent will extinguish the flames in their homes in order to avoid the wrath of the Lunar Beast – Blackpyre. 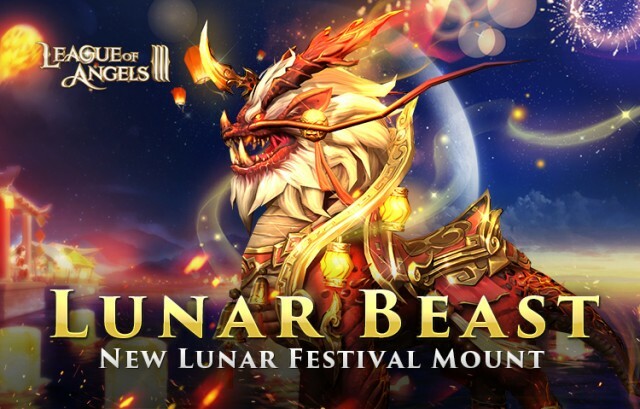 In legends, Lunar Beasts are ancient mythical creatures that dwell in the abyss of sin and only appear once a year during the Lunar New Year. These beasts emerge to engulf the flames of that give warmth and life, until they are satisfied. Each year, when these beasts arrive on the Grace Continent, the people of the land put out their fires and live in the cold darkness, while soldiers are dispatched to chase these beasts back to the abyss. As time passed, the people learned how to catch and tame these beasts, and use their fiery strength to protect the Grace Continent. 1. Added new legendary mount: Lunar Beast – Blackpyre, that grants an enhancement in battle and greatly increases the HP, ATK and DEF of your heroes (improving your BR by over 50,000). 2. Added new Theme Rewards. You can win valuable rewards like Lv5 & Lv7 Gem Exclusive Chests. Do you want to get your hands on the awesome Blackpyre? The new mount will be available in Wheel of Fortune from Feb. 2nd to Feb. 4th. Spin the wheel and try your luck to obtain this legendary mount (both permanent and 3-day versions)!